My husband and I are concerned about the Monarch butterfly migration and have started an effort to get milkweed planted along some bike trails here in Wisconsin. This made me think of Ladybird Johnsons efforts to plant wildflowers along highways. I'm wondering if this effort continues and if milkweed is or could be incorporated into the mix. Any insight would be greatly appreciated. Thank you for your help. All of these answers have other links in them, which you might enjoy reading. Even the New York Times has chimed in on this, with an article on January 29, 2014 Migration of Monarch Butterflies Shrinks Again Under Inhospitable Conditions. "By some estimates, a billion or more monarchs once made the 2,500-mile-plus trip, breeding and dying along the route north so that their descendants were actually the ones that completed the migration." When you realize that the butterflies that return to Mexico ever year are several generations down from the ones that left Mexico the previous Spring, you realize that this is a problem throughout Middle America. Individuals can try to have food waystations on the Monarch route and encourage others to do so. Milkweeds are members of the species Asclepias. 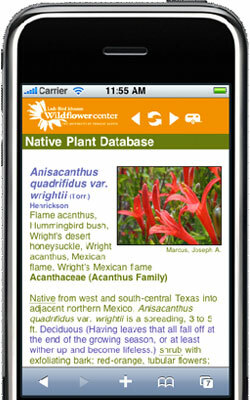 Anyone wishing to search on species of that genus native to their area of the country can go to our Native Plant Database, search on Asclepias and then narrow it down using the search bar on the right side of that page to find their state, and search for milkweeds native to their area. For instance, here are the milkweeds native to Wisconsin. You can follow each link to our webpage on that plant to find out the growing conditions, bloom times and soils required. July 17, 2008 - I have two Black Knight Butterfly bushes in my landscape. Should I deadhead the flowers on this bush? Also, should I prune this back, if so, when, how much? I live near Kansas City, Missouri. October 10, 2008 - What is the name of the small bright yellow butterfly that is dancing all over Austin at this time of year? September 07, 2011 - Could you please recommend a native shrub to NJ that grows to about 3-4 feet, is very low maintenance, does well in afternoon sun and is also something the birds will like? Thank you.